PA Chairman expresses hope that three kidnapped teenagers will be found alive, but also blasts Israel's operation in Judea and Samaria. Palestinian Authority (PA) Chairman Mahmoud Abbas on Thursday expressed hope that the three teenagers who were kidnapped by Hamas will be found alive, Kol Yisrael radio reported. "We hope [the abductees] will be found alive because we are human and will not agree to the kidnapping or murder of innocent people," said Abbas, who spoke at a gathering in Ramallah. Abbas’s bureau, meanwhile, warned in a statement Thursday of what it said was "ongoing collective punishment measures by Israel in all Palestinian territories, especially besieged Hevron." These measures, the statement claimed, were affecting "hundreds of thousands of innocent residents." The IDF launched Operation Brother’s Keeper following the kidnapping of the three students, targeting Hamas infrastructure in Judea and Samaria. Thursday is not the first time that Abbas attacked the kidnapping. 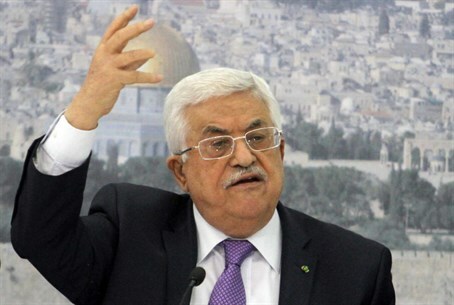 On Wednesday, Abbas accused the terrorists who kidnapped the three teens of trying to "destroy us," meaning the PA. The PA has threatened to end its unity deal with Hamas over the kidnapping according to unconfirmed reports, even as it celebrates the kidnapping. Despite the threats, however, Abbas has yet to actually end the unity deal. Reacting to his statements on Wednesday, the Prime Minister’s Office said that if Abbas was truly sincere about what he said, he would cancel the unity pact he signed with Hamas. "Abbas’s words will be judged by the Palestinian efforts to bring the abducted boys home safely, and the real test is the cancellation of the agreement with Hamas," said the Prime Minister’s Office.